Decrease opioid misuse and harms by coordinating the efforts of public health, medical, behavioral health, payer, and patient communities. Decrease harms and overdose deaths from opioids in the Tri-County Region. Improve the quality of life for people with chronic pain in the Tri-County region. 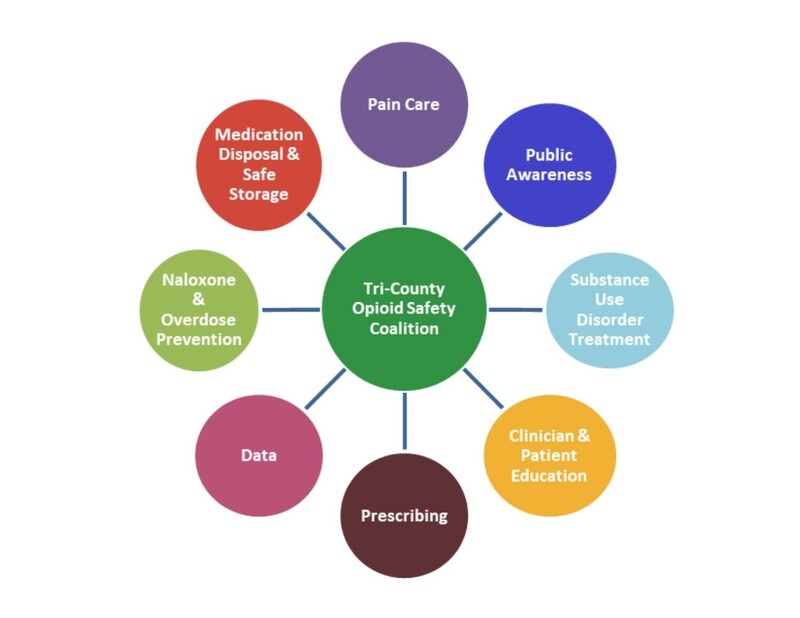 Improve the quality of life for people with opioid use disorder in the Tri-County Region. Pain Care: Increase access to best-practice (and biopsychosocially informed) non-pharmacological care for pain through expanding treatment availability and payment for services. Public Awareness: Support statewide and regional public education efforts on the biopsychosocial pain model, risks of opioid use, non-pharmacological pain treatment, naloxone, medication disposal and storage, and medication assisted treatment (MAT) for opioid use disorder. Substance Use Disorder Treatment: Improve access to services by identifying those in need and providing timely services including medication assisted treatment (MAT) and social support. Clinician & Patient Education: Support statewide and regional clinician education efforts on safer opioid prescribing, the biopsychosocial pain model, risks of opioid use, efficacy of non-pharmacological pain treatment, naloxone, medication disposal and storage for patients, and medication assisted treatment (MAT) for opioid use disorder. Prescribing: Support statewide efforts to promote and implement safe-prescribing practices. Data: Work across systems to identify data to monitor short-term and long-term trends of opioid related deaths, overdose, and overdose reversals; opioid prescribing and use of the PDMP; medication disposal and storage efforts; clinician/provider and public education efforts; MAT utilization; and pain care utilization. Naloxone & Overdose Prevention: Expand naloxone availability to those at risk of overdose and those likely to witness an overdose. Medication Disposal & Safe Storage: Increase access to medication disposal programs at pharmacies and promote the use of these programs through public and clinician/patient education. For more information or to get involved, contact us at tricountyosc@multco.us.